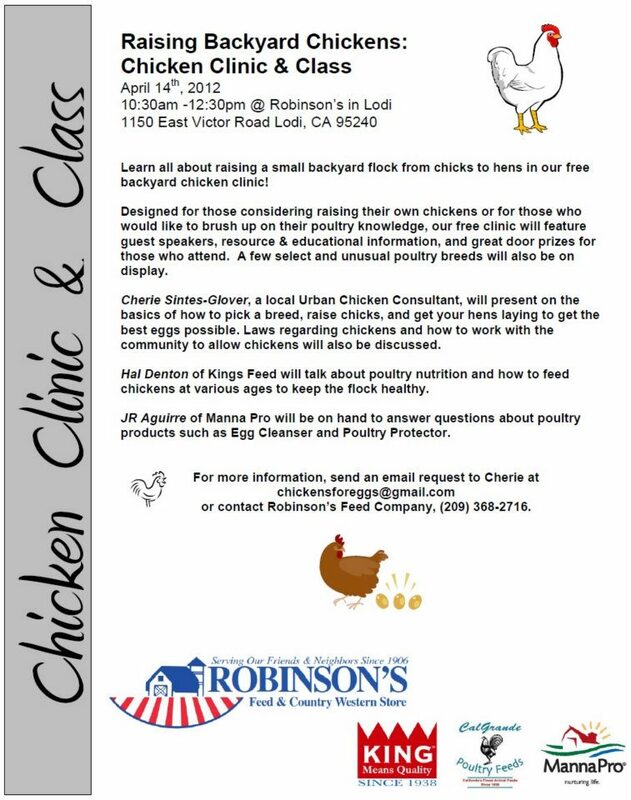 Chickens For Eggs - Chicken Consulting for the Urban Backyard Flock Owner: "Chickens 101" Class" Was a Success! "Chickens 101" Class" Was a Success! Hal of King's Feed and JR of Manna Pro both did a great job presenting on their products. Their support was much appreciated! Many thanks to Robinson's for their hospitality and sponsorship! The staff, as well as Rex & Susie, were wonderful to work with! Please take time to go see them and check out the great poultry items they have in their store. What do you know about zoning issues? If one is in the city (Stockton) is this even possible? How small a flock is viable? Don't want a lot. Small yard, small family. It is so great that you are available like this, to help those of us "thinking about it" to see if it is really possible. A small flock could be as little as two or three hens - that would give you a little over a dozen eggs a week. I normally recommend raising one hen per family member (with maybe an extra or two) in order to have plenty of eggs for omlets. Zoning is interesting these days....every town, city, and location has different rules about backyard flocks (such as how many you can raise, if that number changes for a youth project, how they should be kept) and in most cases, their ordinances are vague - not being clear whether to not a few backyard hens are allowed. Many community members are soliciting their city councils to specifically allow backyard flocks, customizing their "rules" to best reflect the interests of all people – kind of the best of both worlds! A good idea would be to contact your local city government and find out what the current rules are. Chat with your neighbors if you are thinking about raising chickens (bribes of fresh eggs almost always work). More people have chickens than you think! They are either good at hiding them or they have gotten their neighbor’s buy-in. Complaints are what normally make the city/town aware of your “new pets”, and while city budgets may not prompt a reaction or citation, you don’t really want to be on their radar if you don’t need to be. Roosters tend to bring more complaints (as compared to laying hens, which make almost no noise). In Stockton, the last I checked, they allow up to three dogs and three cats per household; so which sounds more of a nuisance – three dogs or three hens? It’s a pretty quick one to answer for most people! 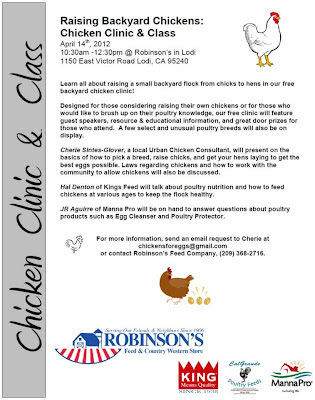 Anything other than cats or dogs is considered against ordinance, so this may be something to look into – there are many, many people in Stockton who DO have chickens. I bet that once the city saw the benefit of laying hens and the demand for it, they would consider modernizing their urban chicken ordinance. Other places all over the US are doing the same thing!